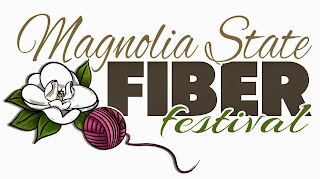 The final countdown has begun: only 4 more days (not including today) until I head to Vicksburg, MS to the Magnolia State Fiber Festival with two of my yarnie besties (Melissa and Lorelei) and I can’t wait. This year, the festival is being held at a new and improved location and I’m already excited about the vendor list, especially Lost City Knits whose yarns are so lovely, I literally haunt their booth every year, trying to decide how many of their beauties I can bring home without The Husband divorcing me. 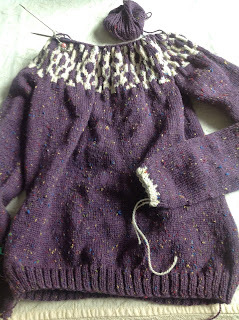 Not to mention I’m taking two classes this year, one on Fair Isle knitting and the other on using a drop spindle which will hopefully help along my sad attempts to spin with the spindle I bought last year. The absolute BEST part though, is always the company! Last year, Melissa wasn’t able to go and Lorelei missed the first day but this year, we’ll all be together again and in our favorite rooms at the B & B that has become our traditional accommodation during the festival. And then there’s the food we eat. So, so good. I’m totally bringing my stretchy pants. Or maybe I’ll wear dresses for some added comfort. Because I DO intend to stuff myself. Since I started the job at the hospital, my fiber time is severely limited. So much so, I often hear sad music play in my head every time I look at all of the projects I’ve made little or no progress on because of my day job. I haven’t been to my LYS in forever. So next weekend, it’s all about friends, food, and fiber, baby! I’ll start my diet right after the festival. Maybe. Have a great time at the fibre festival, Lisa! Your sweater is beautiful, and it looks like you've done a great job on the colourwork. Are you working full time now?